Driven by the thriving ecosystem Software Defined Networking (SDN), Network Functions Virtualization (NFV) and network virtualization market is expected to account for nearly $ 4 Billion in revenue 2014, reveals The SDN, NFV & Network Virtualization Bible: 2014 - 2020 report. A further growth at a CAGR of nearly 60% over the next 6 years is expected despite barriers relating to standardization and co-existence with legacy networks. 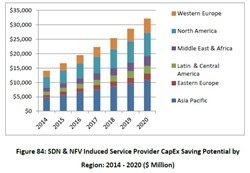 This report also estimates that by 2020, SDN and NFV can enable service providers (both wireline and wireless) to save up to $ 32 Billion in annual CapEx investments. While the benefits of Software Defined Networking (SDN) and network virtualization are well known in the enterprise IT and data center world, both technologies also bring a hosts of benefits to the telecommunications service provider/carrier community. Not only can SDN and network virtualization help address the explosive capacity demand of mobile traffic, but they can also reduce the CapEx and OpEx burden faced by service providers to handle this demand by diminishing reliance on expensive proprietary hardware platforms. Although network virtualization in the enterprise IT and data center domain has received significant attention in the past years, service provider network virtualization is still at a nascent stage. SDN and NFV empower a multitude of network functions to be implemented cost effectively in software, ranging from standard mobile IP Multimedia System (IMS) services to features such as Deep Packet Inspection (DPI). By 2017 we expect to see significant price and gross margin erosion for traditional hardware-based network switching equipment driven by alternative software based solutions. Spanning over 263 pages and 84 figures, “The SDN, NFV & Network Virtualization Bible: 2014 - 2020” report presents an in-depth assessment of the global SDN, NFV and network virtualization market. In addition to covering underlying technology, key market drivers, challenges, future roadmap, value chain analysis, use cases, deployment case studies, expert interviews, company profiles, product strategies and strategic recommendations, the report also presents comprehensive forecasts for the market from 2013 till 2020. Historical revenue figures for 2010 – 2012 are also presented. The forecasts and historical revenue figures are individually segmented for 3 individual submarkets, 2 user base categories, 7 use case categories, 6 geographical regions and 34 countries. The report covers 387 major industry players including Advantech, Alcatel-Lucent, Alibaba, Amazon, Apple, ARM Limited, AT&T, Canonical, China Mobile, Cisco, Citrix, Comcast, Dell, EMC, Ericsson, Facebook, Fujitsu, GE Intelligent Platforms (GE Energy), Google, Hewlett-Packard (HP), Hitachi, HTC, Huawei, IBM, Intel, Juniper Networks, Kyocera, L3 Communication Systems – East, Marvell, Microsoft, NEC, NetApp, Nokia Solutions & Networks (NSN), Oracle, Orange, Qualcomm, Samsung, Tata Consultancy Services, Tech Mahindra, Texas Instruments (TI), Thales, Verizon, Vmware, Vodafone, Yahoo and ZTE Corporation. To browse more Computing and Electronics Market Research Reports visit: http://www.marketresearchreports.com/computing-electronics.